This article covers how to add additional options to products such as Gift Wrap, Assembly, customization or other extra options that leverage an additional cost onto the order. This can be done several different ways, either using native options in WooCommerce, or via plugins or premium extensions, outlined below. This method involves creating an Attribute for your add-on cost, then linking it to your product via Variations. 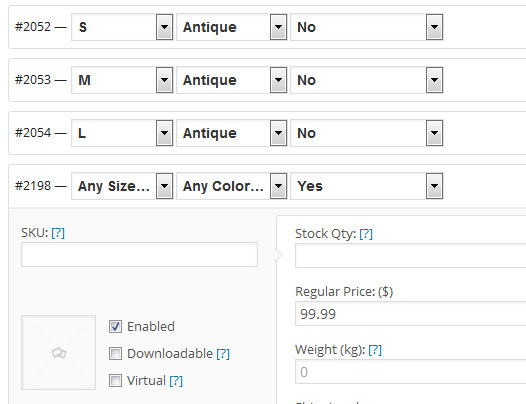 Edit/create your product and select Variable Product from the product type drop-down. On the Attributes tab, add a new attribute (or select a global attribute you’ve already created) with two values such as Yes and No. Two simple options work best. The no option will be the default state of the product/variation selecions, the Yes option will allow the user to specifically select this addon. In this example, we are adding an attribute of “Embroidery” to a clothing item with the options of Yes or No. Make sure you either note the additional cost in the attribute label, or in your product description. Ie “Personalized embroidery is an additional $20.00”. The price on your product will otherwise display the price range. If this is an existing variable product, you will see a third drop-down option on your existing variations for your new add-on option. Set this to your No option. This allows the existing variations to reflect the original price when this add-on is not chosen. If this is a new product, click Link All Variations, then Remove all of the combinations containing the Yes selection for your special option. You should now only see combinations with your special option set to No. Select “Any” for any existing variation option drop-downs, then select Yes for the special option. Enter the adjusted price into the Regular Price field. In this example, we have a dress with Size and Color attributes. Any combination of size and color is $79.99. We also have an additional option for Embroidery – any combination of size and color with the Embroidery option set to Yes will raise the price to $99.99. This is the official WooCommerce extension ($49) that provides a customization screen for adding options to products. 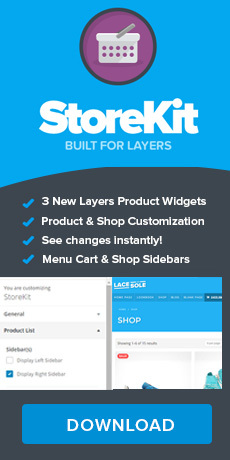 This plugin is compatible with Layers and fully supported by Woo. You can grab this under Plugins → Add New for free. This adds a checkbox above the Add to Cart button on the product for Gift Wrap and lets you set the price/visibility on the product options panel. The downside is it does not have an option for changing the text, so if you want it to say something other than “Gift Wrap?” you will also need a translation plugin to change the english language file or will need to edit the plugin directly. This is a premium plugin for $18 that allows adding several different kinds of options to products. While it is cheaper and more expansive than the official extension, you run the risk of it not being supported or maintained well by the author. Please note we do not provide support for 3rd party extensions or plugins, so be sure to read the plugin page carefully before deciding to purchase. We have NOT tested this plugin with Layers. How can I show different widgets or sidebars on pages?